Elodie is the princess of Nova. She’s 14 years old. And her mother has passed away, so she has to get ready to take over the throne for her 15th birthday. In these next months she has to learn all about running a country and about how to deal with the rest of the world. It’s not easy for a 14-year-old, and when dangers lurk in every corner, it’s a difficult task Elodie has. This is a visual novel by Hanako Games which I at some point put on my Steam wishlist. My brother bought it off that very wishlist as a birthday gift to me and I found it was full och stat-raising. Gosh, I hate stat-raising. And then it’s like impossible to survive! The dead ends are simple to get. You die. As simple as that. How you die, however, is what is interesting. My first death, if I remember right, was being killed in a duel at the ball. I also, at some point, got through a civil war only to die during an invasion right after. I’ve also drowned during the war. In other words, there are several dead ends, but all end up with the same epilogue. These are the ends where you survive, but don’t get coronated. This is the true end of the game. 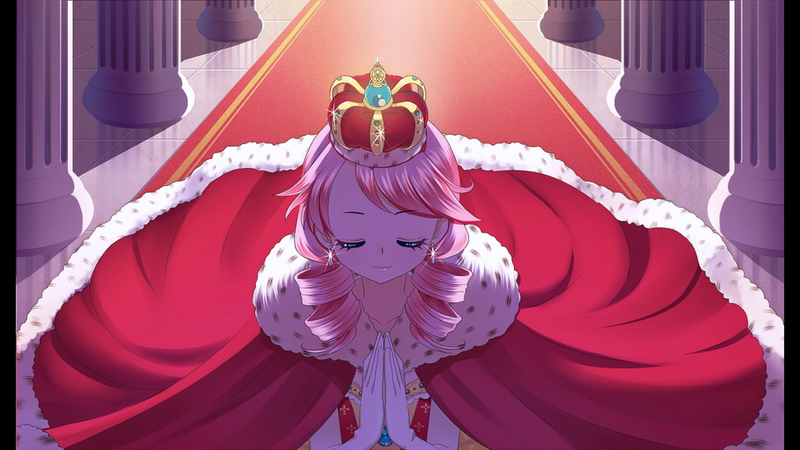 Elodie get coronated but circumstances depends on your choices and gives you several epilogues you can get from a single coronation, which depends on not only your choices but also your stats. Despite the stat-raising and seemingly impossible task to survive to the coronation, I had fun and got to spend some really frustrating hours mixed with lots of laughter. Part of it was all due Elodie’s cluelessness when a stat-test failed, especially when it came it internal affairs or Novan history. The other part was how she died. I also laughed a lot when I somehow managed to survive through the war with social skills alone. You never know what’ll keep you alive, do you? I liked how the checklist keeps track on how you died and even have achievements so you can collect them when you “died in five different ways” or “forced someone else to get married”. A fun game which I really enjoyed, although it was indeed frustrating from time to time. This entry was posted in Game, Visual Novel and tagged Hanako Games, Linux, OS X, otome game, Steam, Windows by Anny. Bookmark the permalink.